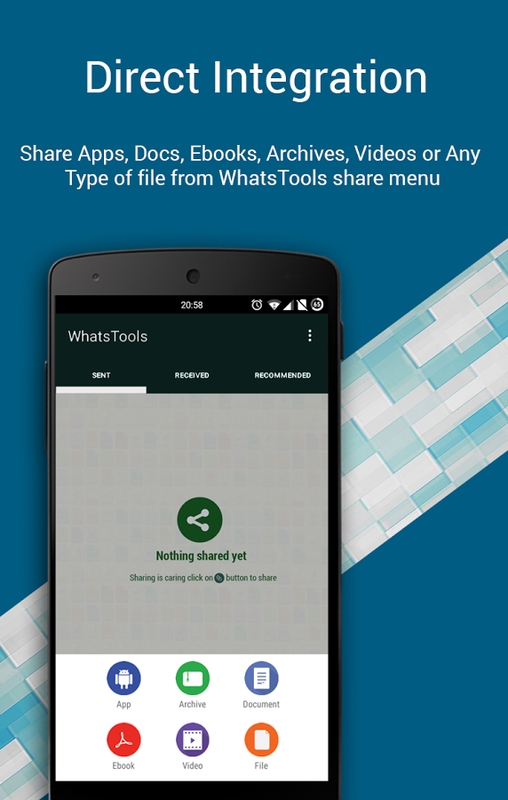 Dear Friends to day we are going to introduce you a new and amazing app named ” WhatsTools ” which will allows you to share your Apps, Documents, Pdf files or any Other types of Files up to 1 GB size Via SMS and Instant Messaging applications. 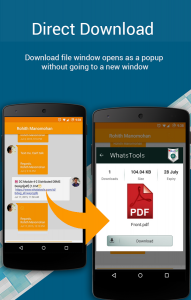 You can Send Any File Type: you can Share any types of file including installed applications, APK files, Archives, Documents, EBooks, Videos etc up to 1 GB size via any Instant messaging applications installed in your phone. You can send Up To 1GB Size: Many of the Instant messaging applications have restriction on size of file sending (16MB) but with the help of WhatsTools you can send files of up to 1 GB size to any of your Instant messaging applications contact. Cross-Platform Feature: with the help of WhatsTools you can Send files to IPhone, Windows Phone & Blackberry etc, If the receiver is on another platform, the link you send will be opened in the browser and the user can download file from the webpage easily. Share to Anywhere: With the help of WhatsTools the File sharing is not limited to SMS or Instant messaging applications. Now You can copy the download link and share it anywhere through SMS, Email or any type of Social Media Platforms. Anyone with the link can download the file from any platform using a browser. WhatsTools will give you Peace of mind: All data which is send through WhatsTools is guarded behind HTTPS/SSL encryption. WhatsTools will connect to your Google Drive™ with your permission to transfer your files. You can view & manage these files from your Google™ drive as well. Connect to your Google™ Drive. Sending virus/malicious files using whatstools are against the terms of service of Google™ Drive. If file is infected, the receiver wont be able to download it. Whatstools use non-intrusive ads. so no annoying pop-up and full-screen ads.